Microgaming has started running into issues in the past year. While they dominate other software companies in terms of the sheer number of games that they have available, they have a lot of competition when it comes to the quality of the games that they produce. This has led to somewhat of a switch in priorities when it comes to the types of games that Microgaming has been working on for 2014. Instead of trying to put out more new games than anyone else, they seem to be focused more on giving players excellent games that they will really enjoy and anticipate the release of. This seems to be the case with a recent announcement that they secured the licensing rights for making online slots based on the Game of Thrones series. Game of Thrones is an extremely popular television show that is based on the book series "A Song of Ice and Fire." 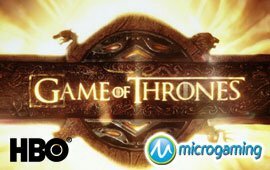 Because this television series is one of HBO's most popular shows and one of the most-watched shows going right now, this seems like a great brand to bring into the Microgaming portfolio. As far as gameplay goes, this is also exciting news. Game of Thrones features several in-depth plots that intersect often to create a lot of extremely interesting characters. With so much going on in the show, this gives Microgaming a lot of different options when it comes to making those characters come alive in an online slot. We anticipate that there will be some way to choose between different kingdoms, since there are so many in the series, but no one can say for sure yet because only a limited amount of information about the upcoming game is available. All we know right now is that it will be released at some point in 2014. Microgaming was the original casino software provider when this industry first started, and that gives them more than 15 years of experience in producing games that players love. One of their biggest keys to staying on top of the industry for so long is that they keep up with the times. They don't fall behind, and they are constantly pushing the envelope and changing their strategy when it's necessary to stay on the cutting edge of the online gambling world.